Matured levain for about 8 hrs. Mixed all ingredients (no autolyse), applied 3 stretches and folds, bulk fermented for about 6 horus over night. Shaped as batard, proofed for about 1 hr and half, and baked at 230C (hot oven/hot pot) for about 25 min lid on + 10 min lid off. Picture of the crumb and crust shown below. Even though I used 40% APF, the crumb did not open much and the oven spring was shy. I would like to improve on these two aspects. I personally think I need to improve the strength of my levain (perhaps need a double build), and maybe autolyse the flour. How much autolyse time would be recommend? What else could I do to improve on these issues? Flavor-wise the the loaf tastes quite good. I love the rye notes that I can taste. Some sourness and also some subtle honey flavor brought out by the dark rye. That is a beautiful loaf! Did you cut it while still a bit warm? The crumb has that appearance. With 40% rye, it will act more like rye than an AP loaf. It may need 24-48 hours for all the moisture to distribute evenly in the crumb. 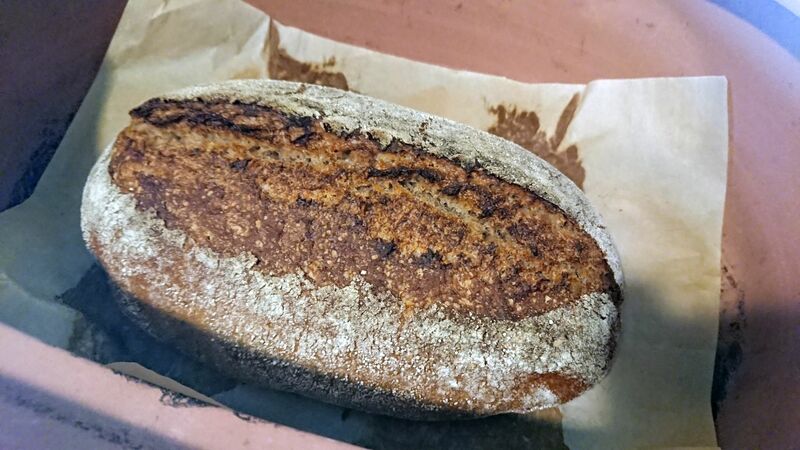 If the rye flour you used was coarse-a bit like cornmeal or cream of wheat consistency, then the crumb will be a bit coarse even with a good soak. Let me introduce you to Stan Ginsberg and his site-the Rye Baker. Here is a link for an article he wrote about different rye flours. Enjoy his site. Yes, it was a bit warm since I was going to have lunch and wanted to have a piece. Next time, per your advice, I will wait longer (if I can, LOL). I am happy with this loaf and 60% dark rye will make it more dense. However, I have seen 100% whole grain bakes around here that bloom like crazy. I would like to figure out how to achieve more spring oven (a bit more). The flour I am using is organic rye with bits that resemble corn meal, so it socked up some water. Thanks for the reference, it looks very useful with beautiful loaves. You may have to use a pan or form (and perhaps up the hydration 80 to 83%) to support the sides during the final rise and bake. Love the entoxicating aromas of baking rye. Will dare anyone to wait until it is cooled down and set for cutting with a sharp straight knife. The loaf looks lovely! You won't have the doubling (100% or more) of volume like a wheat loaf, the rye won't let you but if you managed a minimum 50% increase in volume, you're doing well. The loaf has a very nice lift on the shoulders and looks good! Thanks Mini for the advice. I think I managed to get 50% increase in volume. I will try to increase hydration and will report on the result. Your bread looks beautiful.. yet one more bread for me to bookmark and put in my 'must try one day' pile.. well done! Great! Just finished it for breakfast. Both flavor and texture were quite nice. Old bread is called "Altus" in case you were wondering... or not. There you are giving secrets away again! High percentage ryes do not benefit from stretch and fold because the gluten in rye doesn't have the stretching capability. 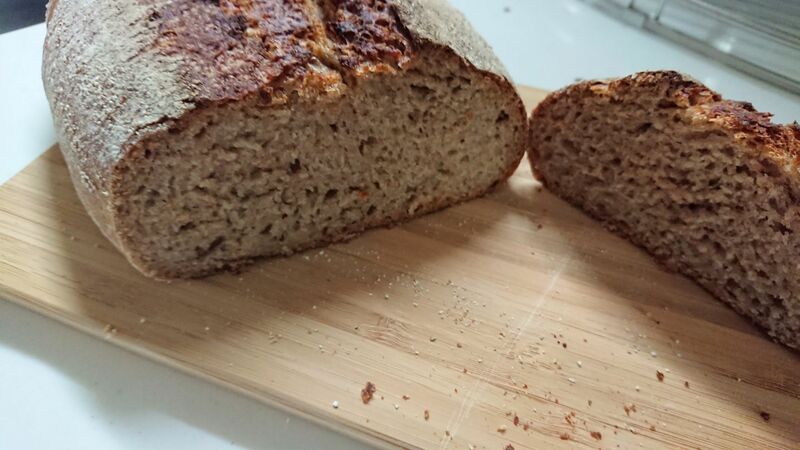 There's no expectation of a very open crumb, therefore, but in exchange a properly fermented loaf has a very tender crumb contrary to its dense look. Hamelman and Ginsberg recommend you wait to cut into the loaf 12-48 hours after baking (depending on the recipe and percentage) on the higher percentage ryes to allow the crumb to set (i.e., not be gelatinous).